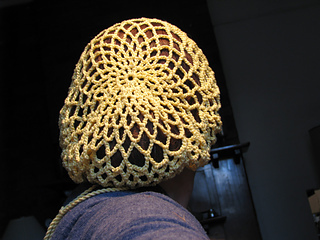 “Almost any kind of yarn or crochet thread will work for this pattern. 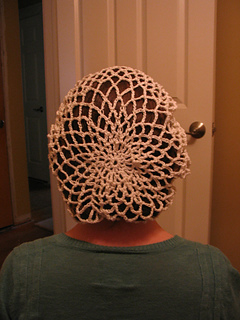 For a finer texture, use crochet cotton, Knit-Cro-Sheen, or pearl cotton, with a “3” or “B” size crochet hook. 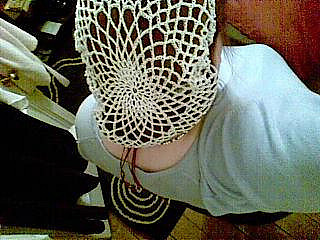 Finished size: Approximately 17” in diameter. 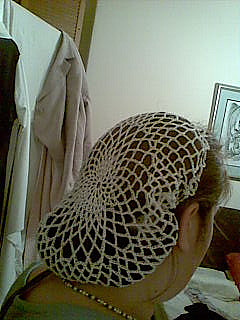 Comes to about the nape of the neck when worn; for a longer snood, repeat Row 15 until desired diameter is achieved. Geocities has closed, however, Reocities has made the pattern available at the link listed. Reocities is a private archiving service and access may temporarily be unavailable. Please try again in a few minutes if you encounter a site outage.